Happy Monday!! 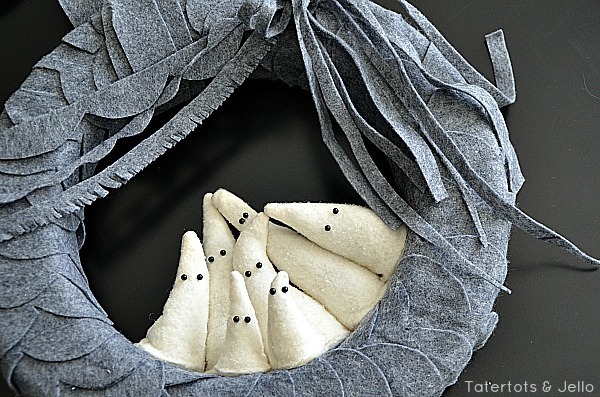 Enjoy this Felt Ghost Wreath! I am in the full swing of Halloween over here — one of my FAVORITE seasons!! And I am having such a great time coming up with a new wreath every month. Here’s my latest one — it’s a Halloween Felt Ghost Wreath. For the past couple of Halloweens I seemed to have a Bat fixation, so I thought it might be fun to make a ghost project. So I started making some little happy ghosts out of some interfacing fabric that I had sitting in a drawer — I love the fuzzy texture. 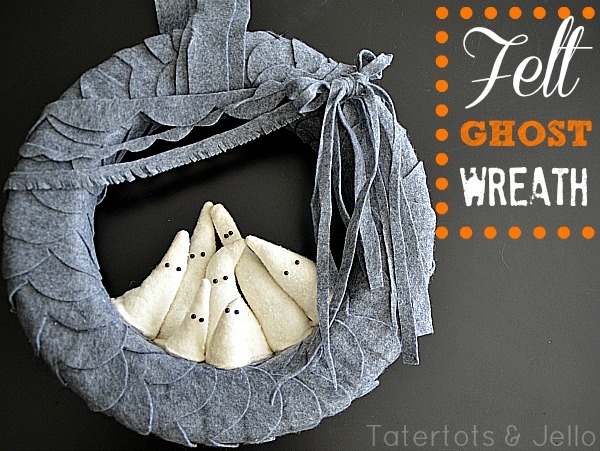 I experimented for a while before I found the right size ghosts to make with this wreath. I printed off the template and taped the scallops together, then I laid the print out under plastic stencil film that you can buy at your craft store. I traced the scallop pattern on the plastic stencil material with a Sharpie marker. then I cut the scallop pattern out using scissors. Once the template was made, I traced along the felt with a pen and then cut the felt with scissors. I made 6 rows of scallops for the wreath (1/2 yard long each). I also hand cut out the three little pennants that I draped across the wreath. Just cut them out of the felt. I made a really small scallop pennant, a fringed pennant and a medium sized scallop pennant. 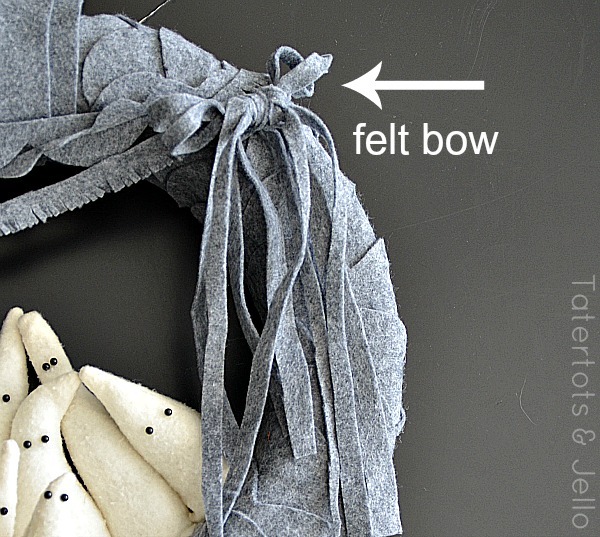 Then I wrapped the wreath form with the felt scallop rows. I started by hot gluing one end to the back of the wreath form. When I came to end of one row, I stopped it at the back of the wreath and started the next one there too — so the seam is in the back. Once the wreath was all wrapped, I folded back one row of scallops and tucked the last row inside of the first row so it was seamless. Then I made the ghosts. I folded the interfacing together and then cut the ghost forms out — basically they are just triangles. Some of the ghosts I made with a little curve at the top. I made a few tall, a couple short and fat and a couple very small. Then I sewed them together, leaving the bottom open. I turned them right side out and then added a little stuffing. Then I cut out some circles and hot glued the ghost body to the circle. And after the glue dried. I cut the circle to fit the ghost body exactly. I then added the ghosts to the wreath. I layered a row of ghosts in the back and then a row of ghosts in the front. The last thing to make the ghosts is to add a couple of pins with black heads for eyes. 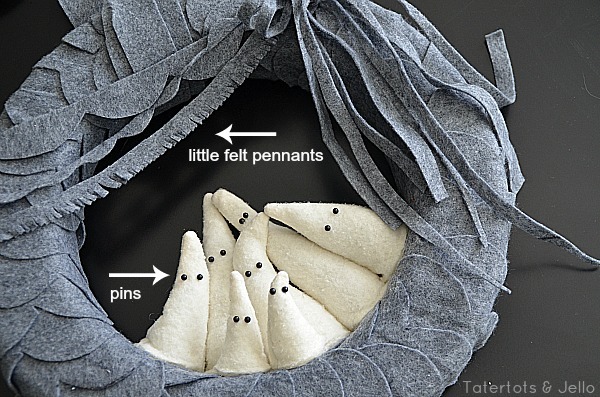 Then I added the little pennants a the top and a couple of rows of felt around the very top to hang the wreath. I love this little wreath. And another thing I love is that this wreath is super light. So I can hang it anywhere. Right now it’s on my front door. Here’s the FREE printable scallop pattern. 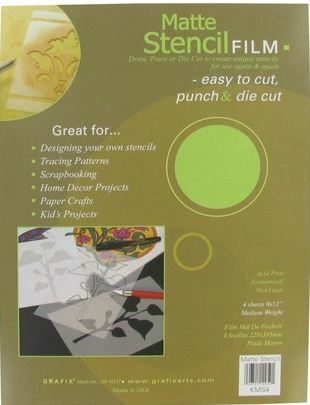 If you trace it and cut it out with stencil material, you can use it over and over again for all kinds of projects. Yay!!! Because… who doesn’t love scallops??? And you can use this free scallop template for all kinds of other projects!! This is the third wreath I have made for the FUN Styrofoam challenge. We also have a fun Pinterest board where we love to pin beautiful wreaths — The Ultimate Wreath Board (Styrofoam)! I am having a ball with Beckie @ Infarrantly Creative and Styrofoam Crafts on this fun 6-month wreath challenge. I love seeing all of the awesome wreath ideas that we add to the board each month!! 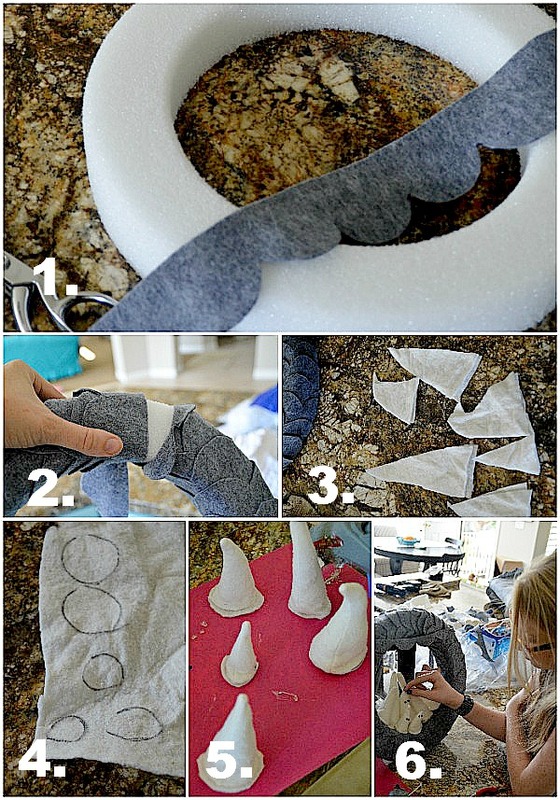 And be sure to follow along with Styrofoam — on their Styrofoam Crafts site. And Crafts ‘n Coffee Blog. Leave a link to YOUR wreath – I would love to add it to the board! Disclaimer: Thanks to Styrofoam Crafts for sponsoring this fun challenge. You can find their products at your local craft store. All opinions are 100% mine. 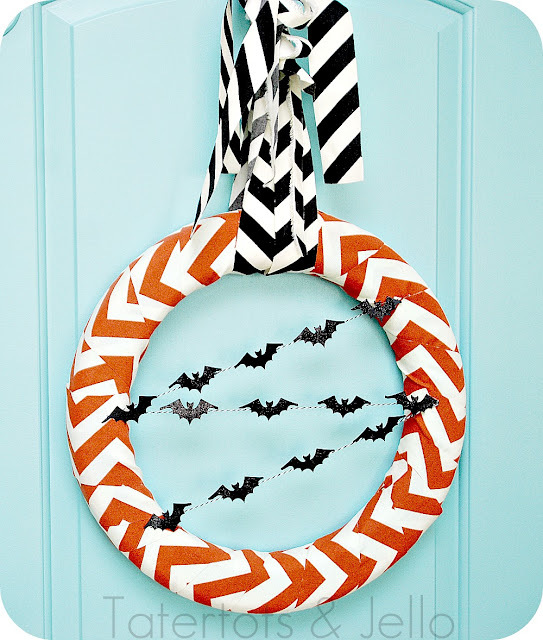 Black and White Halloween Wreath and free Bunting Printables! Make a Whimsical Halloween Spider Wreath! Halloween Wreath & Free Printables! Great Ideas — 20 Happy Halloween Projects!! I should have guessed the link to this cute wreath would lead me to your blog. I love it! Those ghost are so cute! these are really cute and nice i wanna try this myself . do you have any ideas of one for a wedding gift or bridle gift one? 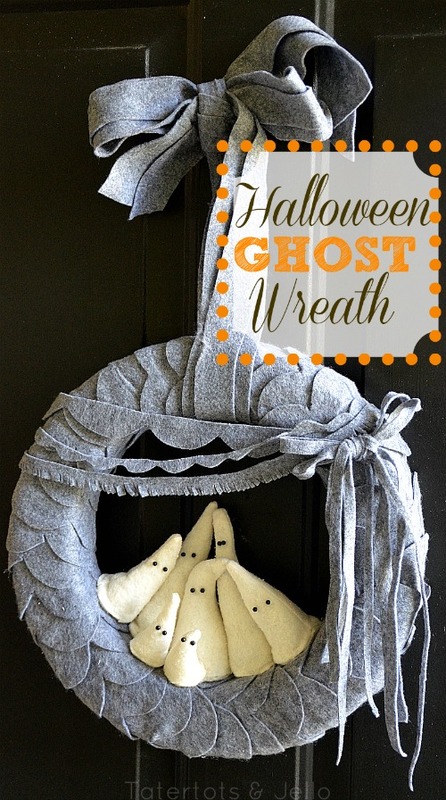 I love that wreath because it is a great base for any month or theme but those ghosts are too cute!! I just finished a ghost project myself and I see more in my future too! Thanks for sharing the template!! 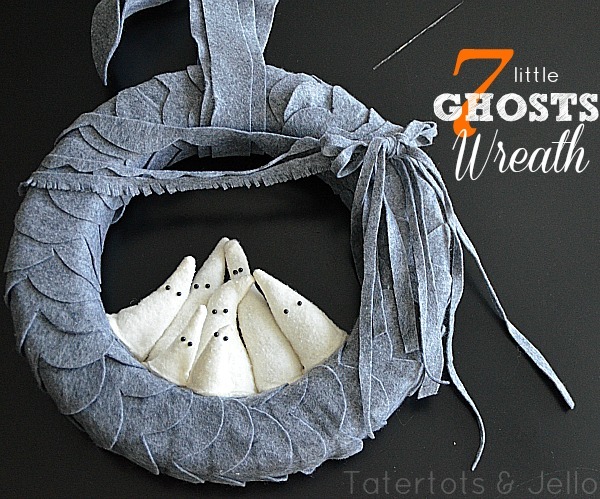 I love the 7 little ghost wreath! Oh Jen, this is amazing. I love it and would buy it from you. You need to sell these!! Thanks Amy!!! You are the sweetest. Thanks for commenting my friend!! 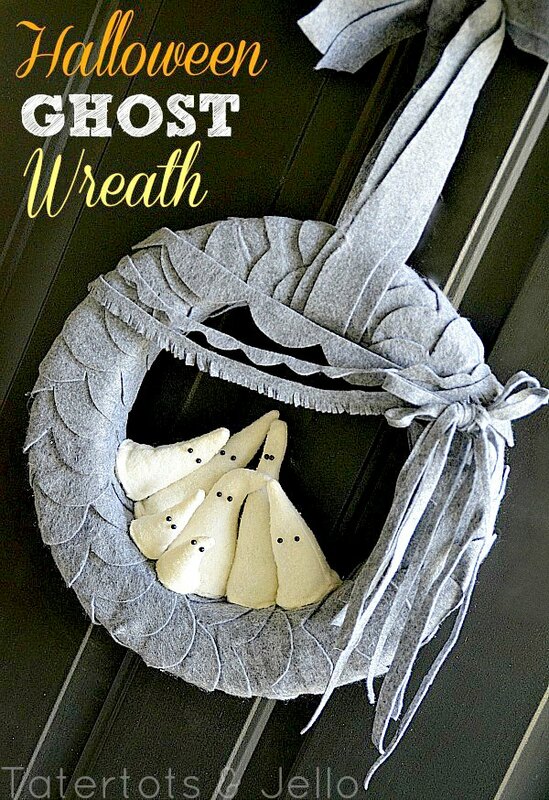 Lovin that cute ghost wreath!!! You’ve been pinned! Thanks for coming by, commenting, AND pinning. Wow – I appreciate it so much!! Darling Jen! You truly have a gift when it comes to wreath creations. 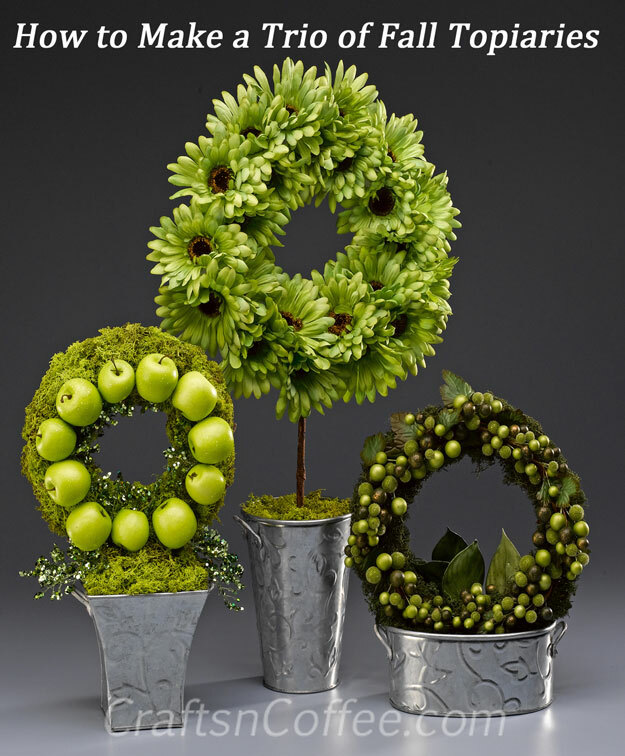 Do you dream about wreaths? Sometimes LOL!! Thanks Tausha. Love ya!!! I’m so in love with felt and yarn wreaths lately! I’m not one to decorate for Halloween, but I do love the scallops…and I have to say the ghosts are pretty adorable! Thanks for sharing the tute and printable. Those wreaths are absolutely adorable! I have to make one! love it, jen! it is so whimsical and cute! You trully are the queen of wreath! LOVE IT! 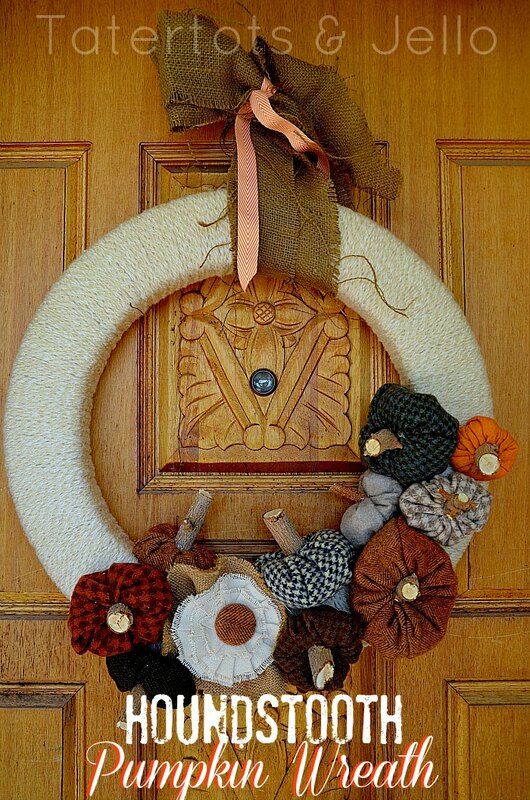 Jen, I love this wreath…Super cute! Kami!!! I loved seeing your cute face. Thanks for the comment my friend. You are so sweet!! Oh my goodness – this couldn’t be any cuter! 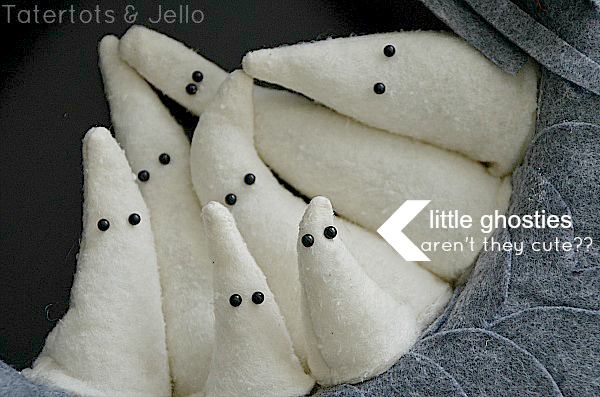 Your little ghosts are just adorable! 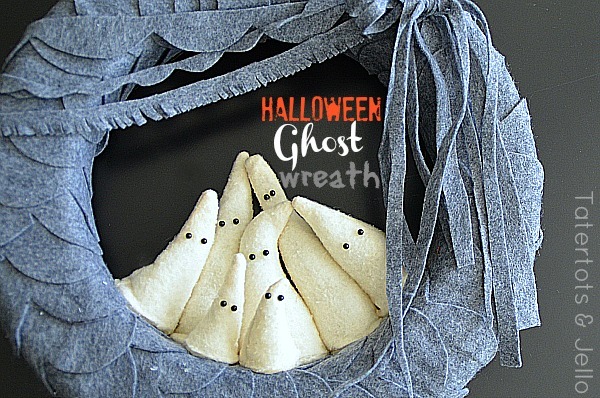 I can see so many ways to use those sweet little ghosties. Thanks, Jen! Jen, this is the cutest one yet! 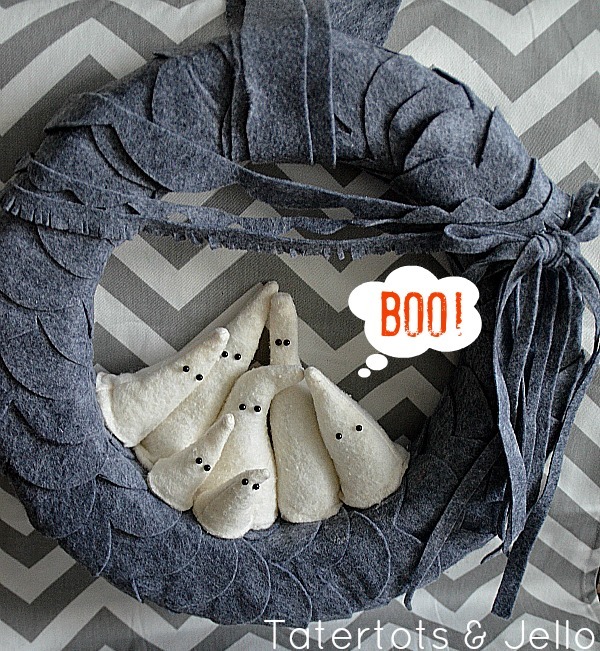 The grey scalloped felt is perfect for the season and those ghosts are superb. I love Halloween, too. Pinning this!